Update on the way: A new location, a new pet, new story and more! Let’s take a look at what other content is in this update! We’ve been listening to your feedback about crafting items in your yard, and we have a pretty big feature to add in this update! Once you’ve completed the harbor mission, you’ll be able to visit A&G Construction and build a factory in your yard! The factory will allow you to automate production. To craft something, you’ll simply need to prepare the machine and the raw materials it needs, click ‘start’, and wait! You’ll be able to automate each stage of the production process, from raw materials to semi-manufactured products, and from semi-manufactured products to final products! This factory is a huge new feature and will save lots of crafting time! Remember that mission on Amber Island? Mayor Gale said that construction could take place so that Portians could have somewhere fun to go. The Mayor is keeping his promise! Once you’ve defeated the Rat Prince, you’ll be able to go back to this island and help the Mayor turn the cave into a themed attraction! The Day of Memories is the third holiday to be added to the calendar in My Time At Portia – after the Day of the Bright Sun and Winter Solstice. This holiday will take place on Summer 27th of each year. There will be an activity on this day, and you’ll get to compete against NPCs for a reward! The difference with this event activity, is that it takes place at night! 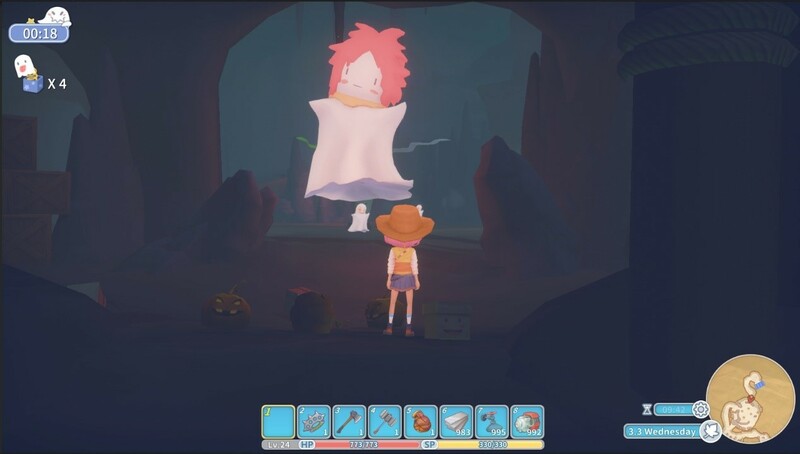 The activity will start at 9pm, and participants will need to find ghost badges that are scattered throughout Portia town. You’ll have a limited amount of time to find as many badges as you can. When the time is up, the person with the most badges, wins! You’ll be able to trade these badges in for Day of Memories items at the Badge Exchange inside the Commerce Guild. We’ve had accessories such as necklaces, sunglasses and earrings in the game for a while now, and these have added to different character stats but are invisible when your character is wearing them. We know you want to be able to see these accessories when your character is wearing them, so we’re making them visible in this update. So, if style is your thing, you’ll now be able to match your accessories to your outfit! We’ve received lots of feedback about the difficulty of managing the items you have because they are being kept in multiple wooden storage boxes. This update will make managing your stored items a lot easier. Now, when you open one storage box, you will be able to manage the items in ALL of your storage boxes! We’ve also added the ability to sort your items at the click of a button! So for example: if you put wood into box A, and then some wood into box B, all wood will automatically be sorted into box A. After this update, the trees you have cut down will regenerate, and some furniture may be removed from your house and delivered to your mailbox for placement again. Your skill points will also be reset, and will need reassigning. You may also find that the loading time when leaving your house is quite long. We’re aware of this issue and are working on a patch to optimise this loading time. Added personal quests for Mint, Dr Xu, and Arlo. Added the first version of the horse racing competition in Spring. Added the first version of the fishing competition in Autumn. Added new white horse in MacDonald’s stable. Elite llama can be captured as a new mount. Added mini game – exploring the ghostly cavern. Added the first version of a new holiday – The Day of Memories in Summer. Added factory. It will unlock after the construction of the harbor. Added rest stop store, harbor store, and a Badge Exchange in the store in the Commerce Guild. Added drop down menu to manage all storage boxes. All storage box items will be shown when opening one storage box, and can be sorted. Added furniture showcase which can display small decorations. NPC location will appear on map when they are a friend of the player. Added electronic saw to cut trees. Electronic saw can continuously cut trees. Added Starlight Island, and dungeon on Starlight Island. Added new weapon – knuckles and intimidating spear. Expanded inventory screen by one page. Added magnifying glass to Inspection mini game to help find distinctions. Added a new photography posture. Several NPCs can wear gifted items for a while. Added several sound effects – sound of waterfall, sound of wind in desert, and sound of the waterwheel. Added three mini games for dating/playing while in Django’s Round Table. Added dating/playing event – fireworks. Added the relationship network – relationship points with one NPC can change your relationship points with another NPC. Tourists can take the bus to and from Portia. Some tourists will go mining in the Abandoned Ruins, and sell their mined materials at the entrance of the ruins. Relic scanner can be upgraded to level three – it can detect five items and display their names. Added deedee station around hot spring. Pressing any button will end the animation after successfully catching a fish. Added the dog – Scraps. Added the start time of holidays and competitions to the calendar. NPCs can help clean the stable and use the irrigation tower. When crafting an item – the number currently in your inventory will appear in the crafting interface. Added two pieces of background music. The tip when successfully learning a craft recipe will be more detailed. Edited some character voices and added more. Added background music for wedding. Adjusted the skill tree and added more more skills. Optimised loading speed and improved frame rate. We will continue to optimise in the next build. Some accessories are now visible when worn. Electric drill can be used to break stone. Players can only equip one item, even if they have multiples of the same item. Food can no longer be used to fuel machines. Helpers will not use food to refuel. Adjusted the maximum distance when taking photos. Players can send a gift once a day. Changed the juice from Day of the Bright Sun to lemon juice. Fixed the bug where the space button would not work after the pressing the escape button when playing on the seesaw. Fixed the bug in Gust’s quest where the actual deadline is different from the deadline shown in the quest detail. Fixed the way of triggering Higgins side quest. Camera lock on an enemy will be cancelled when the playing is riding a mount. Fish will not starve to death if the player does not feed them, but they will need food to breed. 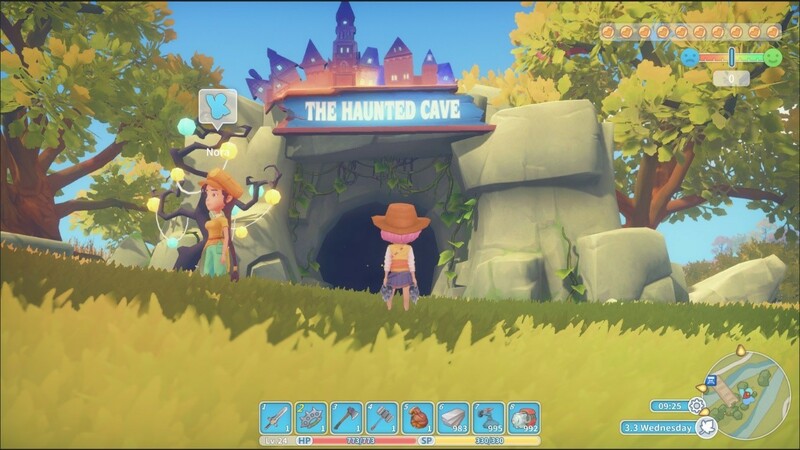 Players will not get stuck in the dungeon in the Highlands. Fixed the bug causing the player character to disappear. Please let us know if you experience this issue again. Fixed the bug causing Aadit and Lucy’s ‘love’ gift preference from showing. Fixed the bug where the player cannot complete Tody’s mission while he is in prison. Fixed the bug allowing players to jump out of a room inside the Hazardous Ruins. Fixed the bug when holding up and item and trying to pick up more items from the crafting machine (pressing E continuously can make player pick up more of this kind of item, even when there's not that many items in the machine). Fixed the bug causing the store price to continuously show 140% of the regular price. Fixed the bug causing the music box to continue to play music after the player has picked it up and added it to their inventory. Fixed the bug showing a machine as still working, after it has instantly repaired an item. After cancelling the repair, the original item will be returned. Fixed the bug preventing the relic scanner from working on certain items, for example: fan and soda. Fixed the bug causing the music box audio to distort when moving the camera. Fixed the bug where Ack has not refuelled a machine – the tip will show that Ack added 0 fuel. Fixed the bug causing ‘Emily’s Well’ quest to not be triggered. Fixed the bug causing tourists to appear in water. Increased the attributes of the cotton llama. Fixed the bug preventing wooden storage boxes and some other furniture items cannot be placed inside the house. Increased the drop rate of valves in Abandoned Ruins 3. Adjusted the mission trigger time on Starlight Island. Added a new button to sort items from inventory into the wooden storage box. Adjusted the background story of Scraps. Fixed the error when using the Relic Scanner. Fixed the bug causing players to get stuck when sitting on a chair. Fixed the gifting animation of Oaks. Fixed the display error of NPC’s umbrella hat. 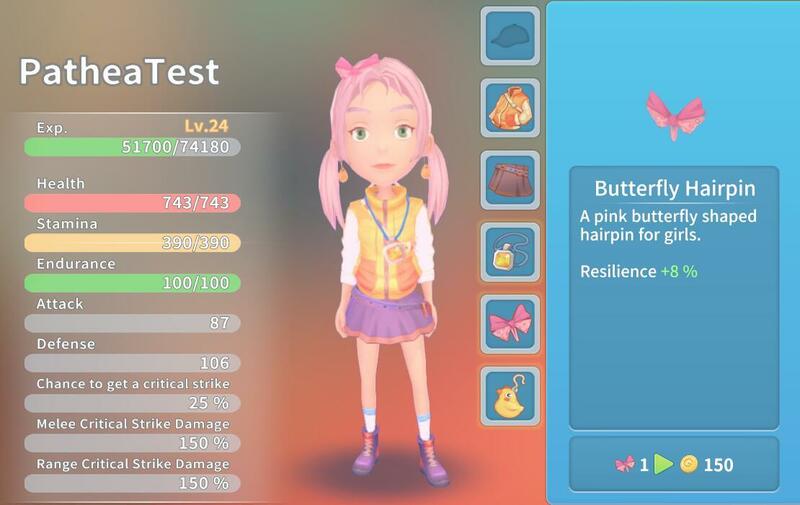 Fixed the error when dating Gust. Fixed the bug causing the wrong number of used materials to show when crafting items in the factory. Fixed the trigger issue of some sound effects. Fixed the bug when changing seasons. Fixed the black screen in the abandoned ruins. Fixed the bug preventing subsequent missions to trigger after the ‘Talk to Mint’ mission. If you have already encountered this bug, please take the task items out of the wooden storage box, or get one of the task items again. Fixed the possible crash when exiting the haunted cave. Fixed the crash when checking the Bacon Fish Roll. Fixed the crash when players go to bed after filling up bait. Fixed the visual bug when using the jetpack inside the Abandoned Ruins. After using the intimidating spear, you will no longer receive a letter from the church, or experience a decreased in favour points with Nora. Fixed the points of entry for the factory and camera positions. The area of the Haunted Cave has been increased to account for some extreme cases in which medals could not be received. In the quest 'A Ruff Sleep', Mint will wake up a bit later after the quest is picked up. Fixed the bug causing the interaction to fail after choosing to stay in Gust's Tomb cleaning quest. Fixed the bug where workshop materials are displayed incorrect when they exceed one page. Sup, nice work guys this is fu... amazing and make me spend a lot of hours playing. i dont know why but factory isnt avaliable for me and i already finish the harbor and ofc finished the main line story.